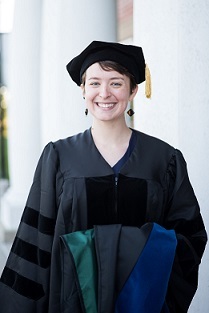 Lindsay Lyons, Ph.D. is a 2018 graduate of the PHD Program in Leadership and Change at Antioch University. 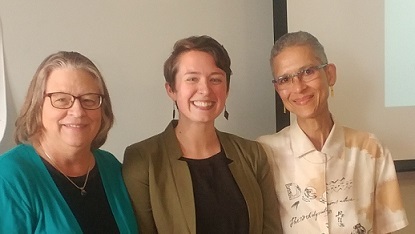 Dr. Lyons at her Dissertation Defense. L-R: Dr. Carol Baron, Committee Chair, Dr. Philomena Essed, Committee Member, Dr. Marc Brasof, [not shown] Committee Member. Lindsay Lyons is an instructional coach who works with schools to develop student leadership, inclusive school governance structures, technology integration strategies, and interdisciplinary curriculum with project-based assessments. Lindsay believes in the power of working in partnership with students to create engaging, authentic curricula and foster an inclusive, justice-oriented community. She taught history, literacy, and feminism courses to high school students in New York City Title I high schools for seven years, in which she specialized in differentiating instruction for students with dis/abilities and students new to English. She holds a B.A. in Sociology and Gender Studies from SUNY Plattsburgh, an M.A. in Special Education from Hunter College, and a PhD in Leadership and Change from Antioch University. Her research interests include student voice and shared leadership in schools. Lyons, Lindsay Beth, "Fostering Leadership in High School: Development and Validation of Student Leadership Capacity Building Scales" (2018). Dissertations & Theses. 449.